At its meeting of January 22, 2015, Toronto’s Executive Committee will consider a report (SmartTrack Work Plan 2015-2016) recommending a work plan for the study of Mayor Tory’s SmartTrack proposal together with other related transit projects. This is intended to dovetail with Metrolinx’ work on their Regional Express Rail (RER) network, and will have spillover effects on studies of both the Downtown Relief Line (DRL) and the Scarborough Subway Extension. The most important aspect of this report is that, at long last, a study is reviewing transit options for Toronto on a network basis rather than one line at a time. Factors such as alternative land use schemes, fare structures and service levels will be considered to determine which future scenarios best support investment in transit. Rather than starting with a “solution”, the studies are intended to evaluate alternatives. If this outlook actually survives, and the studies are not gerrymandered before they can properly evaluate all strategies, then the process will be worthwhile and set the stage for decisions on what might actually be built. The challenge will be to avoid a scenario where every pet project on the map is untouchable rather than making the best of the network as a whole. The term “best” will be open to much debate. How does SmartTrack relate to the RER plan, and how will these services co-exist on the GO rail corridors? How will SmartTrack affect GO’s electrification plans including timing and location of maintenance facilities, and fleet planning? Does SmartTrack trigger the need for additional infrastructure and how will this affect GO operations, the Union-Pearson express (UPX) and the neighbourhoods through which SmartTrack will pass? What is the feasibility of the proposed Eglinton West branch of SmartTrack including a link to other services at Mount Dennis? This is not to say SmartTrack is impossible, but that the vague relationship between this scheme, other plans for the same corridors and existing operations have never been explored beyond the level of simplistic campaign literature. Toronto has passed the point where simply drawing lines on a map constitutes “planning”. That the City Manager “in partnership with the Province” conduct the study described by the report. That Council request that several elements of SmartTrack be included in the RER studies: more frequent two-way service, more stops, “accelerated” electrification, service and fare integration with the TTC. That the City Manager, Metrolinx and the TTC study the feasibility of options for the Eglinton West corridor from Mount Dennis to the Airport Corporate Centre. That the City Manager prepare a strategy for cost sharing of the RER enhancements and for financing the City’s share of capital costs. That funding be provided in the 2015 and 2016 Capital Budget for studies. That Council request the Province and Metrolinx to work with Toronto and other affected municipalities on “an outreach and engagement strategy” for RER including SmartTrack. That various reports arising from this work come to Executive Committee in fall 2015. Funding for the studies in 2015-2016 amounts to $1.65-million of which $750k was approved by Council when it launched this process in December (Request for Report on Review of SmartTrack and Regional Express Rail Plans). The remaining $900k relates to the Eglinton West corridor including a Transit Project Assessment for whatever scheme (if any) proves workable. That assessment would run into 2016. 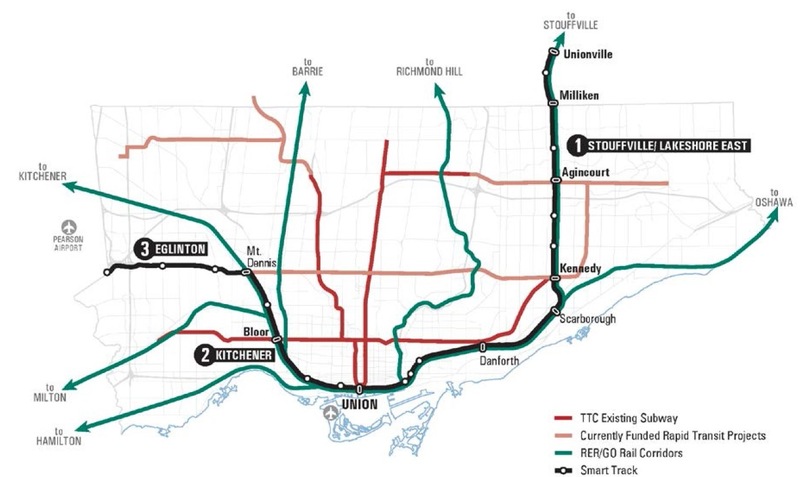 Metrolinx is already working on a detailed review of RER plans for all of its corridors, and will present a consolidated request to Queen’s Park in 2Q15 regarding the priorities for RER and other “Next Wave” projects that, collectively, will draw on the $15-billion provincial commitment for GTA transit over the next decade. According to the city’s report, the province is expected to respond to this request in 3Q15. Obviously the position and scope of SmartTrack needs to figure in this review, and the level of funding required from Toronto for the incremental cost above the RER project is a key question. There are key differences between SmartTrack and the Metrolinx RER scheme notably the service frequency, the number of stops, and the inclusion of a “TTC fare option”. Exactly what this means is unclear because phrases such as “fare integration” mean different things to different people. In Mayor Tory’s campaign, it was clear that he intended SmartTrack to operate as an integral part of the TTC fare system. Whether this would be as part of the base fare, or with some sort of “premium” will depend a lot on the generosity of both Metrolinx (as operator) and Toronto Council (as potential funder) of this service. The current study does not include any discussion of operating costs nor of the financial implications of various fare structures, although service level, integration with TTC routes and fares will play a major role in the attractiveness of SmartTrack as transit corridor. Metrolinx will include fare options in its RER studies, but to what extent this will include SmartTrack is unclear. The capital cost sharing and City financing strategy will be developed for consideration with the fall 2015 report to Council. The strategy is dependent on key elements of the business case such as the incremental capital cost estimates for SmartTrack, and the development potential identified along the SmartTrack corridors. High-level cost estimates for all SmartTrack corridors will be available in the fall. An update to the financing strategy will be provided in the winter 2016 staff report, if required. The report completely sidesteps the fact that “development potential” along the corridors includes lands outside the City of Toronto, and yet there is no mention of participation by the affected municipalities in funding the incremental cost of bringing improved transit service to them. Anyone familiar with the rail corridors in Toronto will know that in some locations, the provision of additional tracks, let alone station structures, will not be a simple matter. The service levels proposed will tax some existing junctions (such as Scarborough Junction where Stouffville and Lakeshore East services merge), not to mention the combined requirements for track time and routing of the many services in the Weston corridor (Milton, Kitchener, UPX, SmartTrack and a future HSR to London). On the Stouffville corridor, GO Transit has already completed an Environmental Assessment for double-tracking the line between Scarborough Junction and Unionville. This study did not review station options except where GO stations already existed (Kennedy, Agincourt, etc.). Even at Kennedy, a proposed new platform would conflict with the existing SRT corridor, and it is unclear whether new SmartTrack stations could be inserted at Lawrence and Ellesmere while the SRT remains in operation. Construction of the “Glen Murray” route for the Scarborough Subway Extension (SSE) would also pose conflicts with infrastructure work for SmartTrack. If SmartTrack is to make a meaningful connection to the subway, it must have a direct connection, not a roundabout walk. The Eglinton West corridor poses the greatest problems because it is a major new component within a larger plan (RER) that is much more fully developed. Until SmartTrack came along, this corridor might have been an extension of the Eglinton Crosstown LRT, or maybe a BRT route, or simply the 32 Eglinton West bus. In an earlier article I wrote about the challenges of getting from the Weston rail corridor to Eglinton Avenue including an interchange with both the LRT line and a future Mount Dennis GO/RER station (That Pesky Curve in Mount Dennis). The Eglinton West link is the weakest part of the SmartTrack proposal, and it is essential that we move beyond the inevitable political debates amounting to little more than “my consultant knows more than those pesky transit bloggers”. Totally absent from the city’s proposal is any study of westward extension of the LRT line, no doubt because in its current planned state as a surface operation, this would arouse the wrath of Etobicoke politicians who would lie in the path of bulldozers before an LRT was allowed across the Humber River. If, however, we are prepared to bury SmartTrack on Eglinton West, why should this be the only option? This is a glaring omission. Transit network connectivity and access to service. This leaves many options open and I can only hope that alternatives will not be precluded before staff have a chance to review what might be possible. Although a small maintenance facility is planned for the UPX trains, this will not be sufficient for the scale of operation SmartTrack entails. The staging of electrification on GO’s network will be driven by many considerations including the amount of opposition to electrification on line still owned by the freight railways. This may require a rethink of how GO services are now operated to optimize the use of electrified territory. That is an issue for the RER studies, but the service level implied by RER plus SmartTrack operations will certainly shift priorities among the corridors. An important part of this study will be a review of how SmartTrack and other proposals will affect and work together with each other and with development plans. The analysis of the SmartTrack proposal’s potential ridership will be undertaken by City Planning and the University of Toronto in consultation with Metrolinx and the TTC. A key input to the City’s and University of Toronto’s Regional Travel Demand Model is the distribution of population and employment. Projections of population and employment for 2021, 2031 and 2041 will be produced by City Planning and Strategic Regional Research Associates (SRRA). The projections will be based on the small area projections developed by City Planning as well as readily available projections for the GTHA area, augmented by a more up-to-date assessment of residential and commercial development potential along the SmartTrack corridor. SmartTrack has often been touted as a replacement for the Relief Line subway, although it more likely would only defer, not eliminate the need for additional capacity into the core area. Rather than debate this question as a matter of suburbs-vs-downtown fervour, Toronto could finally see updated numbers to show how all of the potential additions to the network might fit together and who they will serve. An important related question is that of real estate development and intensification of residential and work-based populations. Do the many proposals require additional development to make them financially worthwhile? What is the potential benefit for land owners, and for municipalities who will reap higher taxes? Will additional revenue actually be used to offset transit investment costs, or would it be needed for other improvements? The studies of SmartTrack, RER and other transit proposals provide an opportunity for a unified view of rapid transit improvements rather than the piecemeal approach taken by individual agencies and politicians. When the work plan report comes to Executive and then to Council, it is vital that this process not be gerrymandered in advance to favour specific schemes or outcomes. Indeed, a study which is seen to be fair and unbiased is the best possible support any project could have. With unusual speed, Toronto will have specifics to consider, real options to digest, and this should lead to an agreed plan, not simply more rounds of debate. Whether the outcome will be to everyone’s liking is another matter. What Toronto needs is the best elements of the many proposals now on the table, with no sense that “my line” or “your line” takes precedence. This entry was posted in A Grand Plan, Beyond 416, Downtown Relief Line, Eglinton LRT, Electrification, Finance, GO Transit, Scarborough RT/LRT/Subway, SmartTrack, Subways, Transit. Bookmark the permalink. ← TTC 2015 Budget Preview: Business As Usual or Transit Renaissance? I was hoping that it was but with some of the trolls who hang out here you never know. Besides, it gave me the opportunity to expound on Physics. Thanks to Robert for his physics basics. Metrolinx is having public meetings tonight and Thursday night about improvements to the Stouffville line. They see the demand in the peak period 3 hours, not per hour but per 3 hours, increasing from 7300 to 11,500. This would save about one train per hour off Yonge. The plan for Richmond Hill line is to go to 3 or 4 trains per hour peak and half hourly off peak. This compares to the existing service north bound at 15:10, 16:30, 17:00, 17:30, 18:45 and 19:40. This line runs 3 train in the rush hour and because of its route and the fact it is on CN’s main transcontinental line means it will never have any major impact on Yonge Subway loading. The RER plan would still have only 15 minute service peak. The expansions to GO as planned on Stouffville and Richmond Hill will barely keep up with demand from 905 and will have little benefit for the Yonge Subway. There are a lot of people who get on the subway west of the Stouffville line for whom the SmartTrack or RER will provide no help. If there is not a DRL built then it will be difficult for people to get downtown because of overcrowding. Those who live downtown will stick to surface transit which they hopefully will be able to get on. I am beginning to wonder if we are going to start hearing SmartTrack, SmartTrack, SmartTrack, from Tory like we heard Subways, Subways, Subways, from you know who. I am wondering if we should tie some politicians to the rear bumper of a 1960 era fishbowl and let them inhale the fumes. It might clear their thinking. Robert, I would put to you that at Richmond Hill City Centre, this might not be bad, and if we can just keep riders at this point and north from finding their way onto the Yonge subway, we may well be averting a future load growth of 4 or 5k peak hour (does not sound like much but when the time comes that may be huge). I would find an real exploration of converting this route to LRT interesting just to get around sharing the C.N. mainline. If you could jump out onto a right of way in Bayview, south of the C.N. mainline (required the line south of here to be abandoned for mainline use) you might be able to get around this limitation. Clearly the type of car that Metrolinx has indicated for Toronto elsewhere would not suffice, as you would want higher speeds to make this route attractive. It would also require some expensive work at the core end of the line, as you could not run in the USRC either. It would open up the possibility of service every 5 minutes, and thus be more attractive than now when compared to Yonge. If you were to use cars similar to the Alstom car OC transpo is proposing (49 m long speeds to 100 km/h) and ran in 3 car trains at 5 minutes that would 9,000 per hour in capacity. You would have the future option of running on a shorter headway. This would be a very expensive proposition, but it would make transfer from the TTC routes where the line currently has stations much more attractive (including the Sheppard subway). Clearly this is not a viable short term option, but if we actually want to pull load from Yonge further north, service on the 15 minutes is not likely to attract riders within the 416. Also you would not want to add stations as it would slow the line, and no this could not be considered to be a replacement for a Downtown Relief line, especially as there is no way to link it to Danforth. This would be a pure commuter LRT collect at periphery deliver to core, and the only reason for LRT would be the north end issues relating to rights of way. “Robert, I would put to you that at Richmond Hill City Centre, this might not be bad, and if we can just keep riders at this point and north from finding their way onto the Yonge subway, we may well be averting a future load growth of 4 or 5k peak hour (does not sound like much but when the time comes that may be huge). I do not think that you could get the Bala Sub “abandoned” south of the York Sub because there have been times when CN has used it to get trains to MacMillan Yard when there has been problems on either the York or Halton Subs. It is more important for the Halton Sub because if you get a derailment on it the trains from Southwestern Ontario come into the Bala Sub and then go up to the York to get to Mac Yard. It might not happen often but it does happen. Spending the money to run an LRT down the Don Valley to Union would provide a scenic, but essentially useless route. It would not make convenient transfer connections to much of anything. It would be much better to run something north from Don Mills and Eglinton, either extend the DRL or build a Don Mills LRT line north and into Markham. Resurrecting the North Yonge Radial Railway along the Bala Sub is not going to work. York Region may not like it but Yonge Street north of Steeles cannot have a subway because it would make travel on the Yonge subway impossible. They will have to use lines much farther to the east and west of Yonge Street. It is not the responsibility of Toronto to make up for their poor urban planning. It is a job for them and Metrolinx. @Robert Wightman, the idea here is to not connect very often. You could perhaps maybe at Eglinton, but running a competitive service on Don Mills would be needed to stop for local bus lines and use for Don Mills adjoining residents. The notion of being in the valley would be to remain express. If you cannot run express it will be hard to attract riders at the far north end. To my mind Don Mills rd needs to be local, or if it is express will be aimed at at different goal than developing the area. LRT in the Valley would be aimed strictly at frequency for the outer 416 and 905 to keep them off Yonge. If you do not run at higher speed and with few stops I do not think it will be fast enough to be attractive. GO with 5 min headway would be attractive for core bound riders, and much faster than Yonge. South of Sheppard LRT in Don Mills rd would serve to divert different riders. DRL can serve those. The in valley link does not serve that purpose, but York will grow, and forcing an unattractive ride will not work electorally and riders will create a demand that will end up on Yonge. If you cannot abandon the line and get short headway for an express route, I worry the ridership Sheppard and North that is core bound will be on Yonge. If it has stops like the DRL should, it will not be attractive. The only reason for LRT is to be able to create exclusive high frequency ROW. If the line south of the CN main cannot at least get time separation it is a mute [sic] point. Oh and Robert this in Valley route would not be a TTC service, as it would be a GO type service using LRT. LRT on Don Mills however would be different that would be TTC, and local. LRT can also be limited stop acting like commuter train, which is what I was thinking. If you do connect in a lot of places, it becomes local. To paraphrase you, Metrolinx needs to start thinking more like a rapid transit provider. Headway close to Yonge will be important. An idea out of left field for North Am systems, San Diego Trolley besides, but the Karlsruhe Model has not been mentioned once, and yet could offer very vastly greater economy and flexibility by utilizing mixed light and heavy operation on the same tracks. Even as a tech, I would have thought the wildly differing voltages and AC v. DC operation would have proved impossible, but the Germans have not only solved that, they offer the technology for sale to the world. The Eg West branch especially would lend itself to surface running, and then downtown, it could go subsurface to the Don Valley, and either rejoin the Lakeshore or Don Valley lines. Steve: This has been discussed here at length before. The fundamental problem is that North American railway rules (including Canada’s) do not permit the intermixing of light and heavy operations as occurs in Europe. Not sure if this plan would help the Smart Track plan, but, I think it is some great news. In today’s Metro had this article about the Stouffville Line. Fantastic news – hope they get this done – would help not only Stouffville, but, Scarborough as well. Can they twin the track south of Sheppard as well – seems like there is a lot of room by the present day SRT line? I hope they grade separate more of this line like they did with this line on Sheppard @ the Agincourt GO station. Fantastic work – this line would need to be grade separated at Danforth Rd (not Ave) near Midland – as well as Finch and Steeles and other streets as well – most importantly this type of investment increases safety greatly, it also increases the efficiency and scheduling to the system – GO will compete with the private auto – if it were that reliable and convenient with all day 2 way service – other one to work on is the tunnel west of the James St. GO station in Hamilton – that heavy transit corridor needs all day 2 way service as well – not just the Aldershot station – but, the present day James St. Station. – fantastic location – right in the heart of the Hammer’s improving downtown core – great bus connections as well and hopefully the 1st of Hamilton’s 2 planned LRT lines. Steve: The work that has been announced does not include any grade separations. As for the section further south, the design in the EA does not include new stations where SmartTrack would need them, and these likely conflict with existing SRT structures.